Described by Cornel West as “a towering public intellectual and the leading universalist philosopher of his generation,” Forrest Church was one of the preeminent liberal theologians of our time. His final gift, The Cathedral of the World, draws from the entire span of Church’s life’s work to leave behind a clear statement of his universalist theology and liberal faith. Giving new voice to the power of liberal religion, Church invites all seekers to enter the Cathedral of the World, home to many windows but only one Light. In February 2008 I received my death sentence. The warning bell had rung a year and a half before. After living in cancer’s shadow for a surprisingly uneventful span following the November 2006 removal of my esophagus (together, we hoped, with the disease that had riddled it), my luck ran out. The cancer had returned with a vengeance. Stage IV esophageal cancer, the medical terrain I now occupy, is incurable. Not without reason (though supplementing my doctor’s cautious reckoning with imprudent visits to the Internet), slightly more than a year ago I was measuring the life remaining to me, if not in coffee spoons, certainly not in years. With time now on the march, I determined to write one final book, Love & Death: My Journey through the Valley of the Shadow. Returning to Beacon Press, where publisher Helene Atwan graciously welcomed me back into the fold, I dispatched the book swiftly, for both practical and spiritual reasons--notably to avoid getting caught facing two deadlines at once. Beacon rushed the book, beautifully produced, into print by June, an act of robust skill and true kindness for which I shall always be grateful. Admittedly, I wrote Love & Death in a slightly enhanced state. Not yet accustomed to the steroids my oncologist was doling out to help me tolerate an intensive weekly chemotherapy regimen, I could easily go forty hours a stretch without sleeping. As I told my congregation, I hadn’t been so high since the late v´60s. For a time, my journey toward death sailed along as anticipated. By May, I had lost twenty-five pounds. Death hovered closer every day, or certainly seemed to. But then the tables turned. I gained all my weight back and began feeling better physically. Meanwhile, the tumors, scattered throughout my lungs and liver, dwindled to almost nothing, offering a year’s reprieve. As the poison did its work, I lived in a kind of suspended animation. My death interrupted, life became timeless. Near the end of this welcome hiatus, a year dedicated in part to reading hundreds of books--it’s like dying and going to heaven-- I got the itch to write another one myself. Under the canopy of my ministerial calling, I’ve been blessed with three distinct vocations: as a pastor first and foremost, but also as a historian and liberal theologian. In early 2007, during recovery from my cancer operation, I finished the sprawling narrative history I’d always hoped to write, So Help Me God: The Founding Fathers and the First Great Battle over Church and State. This accomplishment rounded off my historical trajectory, launched more than thirty years earlier when I received my doctoral degree in church history. In 2008 Love & Death put a capstone on my pastoral career, summing up what I had learned during my three-decade tenure as senior minister of All Souls Unitarian Church in Manhattan. I loved writing that book. It offered me a final pastoral opportunity. And it gave me the chance to ponder life and death from a new, more intimate, perspective. There was only one problem. When my renewed lease on life made it possible for me to consider writing one more “final” book, Love & Death didn’t naturally lend itself to a sequel. Only one genre of my work remained incomplete. I had not systematically laid out my universalist theology. I’d never gathered my thoughts on religion, faith, and God in a single volume. So I decided to seize this unanticipated gift of time to frame my theological teachings. Drawn in equal thirds from new material, previously uncollected articles and addresses, and selections from my earlier books (all thoroughly revised and reimagined), The Cathedral of the World completes the arc of my third vocation--as a universalist theologian. Universalism speaks with particular eloquence to the challenge of our times. Today our neighbors live not only across the street, but across the world as well. During an age when we share a global economy and communications system in addition to nuclear and environmental threats, universalism addresses our era’s most dangerous dysfunction: theological parochialism. Every denomination, including my own Unitarian Universalist Association, can fall prey to such nearsightedness. To fulfill its promise, modern universalism must witness against fundamentalists on the left as well as those on the right. By definition, “universalism” is not the property of any discrete religious body, including those that include it in their names. To illustrate this point, which pivots at the center of my theology, let me take you on a brief initial journey. We shall walk together to the water’s edge and follow the light of the moon wherever it may lead. We are standing on the shoreline of a mountain lake, moonlight lapping against our boot tips, mesmerized by the golden carpet laid out over the water as if lowered from the heavens to meet us at the very place we stand. Before us, along the moon’s glorious trail, we can see all the way to the lake’s rocky bottom. Above the sunken branches, we watch the water dance and sparkle, a rack of moonbeams on each ripple’s crest. Across the lake, where the moon is rising, our path turns to liquid gold. Standing on the shore some distance to our right, a man contemplates the same view yet appears shrouded in darkness. To our left stands a woman, her silhouette all but obscured by the blackness that envelops her. Henry David Thoreau once chastised the Florentine artist and adventurer Benvenuto Cellini for mistaking the aura he saw surrounding his shadow on a dew-drenched day as a special sign of divine recognition. In the moonlight, we experience a like illusion, as do the man and woman to our right and left, who share our vision though we perceive them to be in darkness. Judging only by what they see, they, too, may feel themselves uniquely illumined. To their eyes, it is we who appear to languish in darkness. Expressive of both the wonder and danger of religion, on the one hand, the moon’s golden light extends a path across the lake to the feet of everyone who stands under the spell of its supernal glow; on the other, given that each onlooker sees only his or her own golden pathway, all others standing in apparent darkness, we are left with the impression that we walk the one true path alone, whereas those who fail to join us are lost. Here nature can serve as our theological tutor. She reminds us that, in almost every way that matters, we and our most distant neighbor, sprung from a single source and sharing the same destiny, are one. This revelation encapsulates the essence of universalist theology. To perceive things as they are, not merely as they appear, we must view them with parallax vision. We must imagine seeing them through others’ eyes as well as through our own. The Cathedral of the World begins with a like metaphor (“one light and many windows”) drawn from the introduction to Unitarian Universalism that I wrote with my colleague John Buehrens. Although tailor-made for my own denomination--Unitarian, “one light,” Universalist, “many windows”--my cathedral metaphor weaves an allembracing theological garment, suitable for universalists of every religious persuasion. Since universalism springs from a set of liberal religious propositions, I follow this opening statement of universalist principles by offering evidence for a liberal interpretation of the divine. I am a born-again liberal. My religious liberalism is unapologetic--enthusiastic and unabashed. The word “liberal” means openhearted, openhanded, and open-minded. We need only consult the dictionary to reclaim this much-abused word. Liberal means free; worthy of a free person (as opposed to servile); free in bestowing, bountiful and generous; free from bigotry or unreasonable prejudice in favor of traditional opinions or teachings; open to the reception of new ideas. The phrase “dogmatic liberal” is an oxymoron. Unlike every form of fundamentalism, the liberal religious spirit grows and moves. Revelation is not sealed. I open with a full-throated celebration of liberalism, freely adapting two chapters from my book God and Other Famous Liberals. It was there that I initiated a career-long quest: to reclaim Bible, flag, and family from their late captivity by the religious right. Book I addresses the first and third of these still unfinished tasks, reclaiming Bible and family. In Book II, “The American Creed,” I tackle the second task: reclaiming America’s most powerful symbols as liberal symbols, not conservative ones. Consider the United States motto, expressive of our nation at its aspirational best: E pluribus unum, “Out of many, one.” Like my cathedral metaphor, this motto captures the spirit of universalism. Liberal religion was present at the nation’s founding. In the Declaration of Independence, the United States of America threw down a challenging ethical gauntlet: liberty and justice for all. This egalitarian mandate, grounded in nature and nature’s God, has strong liberal religious underpinnings and animates what I, not uniquely, call the American Creed. Book III I dedicate to the liberal pulpit. Even as the Gospels define Jesus Christ as the word made flesh, for me a sermon is the flesh made word. No presentation of my faith would be complete without a representative selection of sermons. The pulpit is my forge, where week after week, in response to the call of the hour, I have hammered out my theology. More than a sample of opinions on issues of the day, the third section of this book captures universalism in action. I unpack my theology in a more systematic way in Book IV. 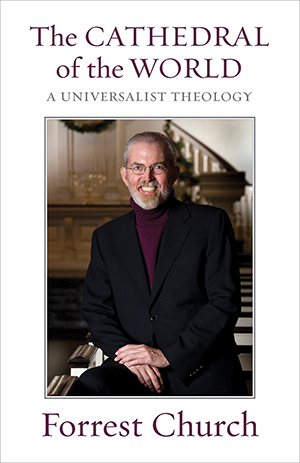 It builds toward a mature credo statement, “Universalism for the Twenty-first Century.” Although I originally addressed several pieces in this section to members of the Unitarian Universalist Association, they nonetheless lay a foundation on which to build a contemporary universalist theology within almost any faith tradition. I close this exploration of universalist principles with two excerpts adapted from Bringing God Home, in some ways my favorite, most personal, book. I shall leave you in Book V with some thoughts I find myself pondering in preparation for my death, postponed though it may be. The publication of Love & Death elicited a number of radio and television interviews, one of which I include here, together with further reflections on the subject of love (the heart of the universalist gospel) drawn from a sermon I preached in early 2009. Finally, for my benediction, I reach back to my first book, Father and Son: A Personal Biography of Senator Frank Church of Idaho, written in 1984 during the summer following my father’s death. Universalism emerges from the shadows as clearly as it does from the light. Though I view the one light most receptively through my own chosen windows, The Cathedral of the World lays out the nonsectarian underpinnings of a twenty-first-century universalist faith. Partly in the hope that we will take our own name more seriously, I present it first to that hardy little band of freethinkers who call themselves Unitarian Universalists. They have offered me a home in which to formulate and test out my theology. For this, I remain eternally grateful. Cognizant of their potential saving impact on and in the world we share, I offer it also and with equal gratitude to universalists in other faith traditions. Given the breadth and scope of the universalist gospel, theologically we hold so much more in common than could ever divide us. Finally, I extend my hand to the unchurched seeker. You, too, are on a journey, a quest for life’s meaning and purpose. I believe both can be found in universalism, where you may discover, as I have, that to be saved without damning another is a wonderful thing. 5. What Would Jefferson Do? Benediction: Where Did We Come From? Where Are We Going?